This time Japan by bike, a new experience! We started in Fukuoka the most southern island of the four main islands of Japan. After a 12 hour flight from Amsterdam via Frankfurt, Osaka to Fukuoka we cycled 6km to the city centre. 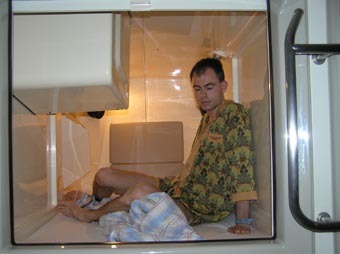 Since Japan is a quite expensive country we choose for a capsule hotel (Yen 2800±20Euro). Here you get a room the size of a bed. A bit claustrophobic for the first minutes, but once in a lifetime experience. The streets are filled with western style suits and women with high heels. After exploring the city and getting our supplies we left Fukuoka. Leaving the build up area of the city took quite some kilometres before the first rice fields appear. The first night the tent was pitched near a river with a Dutch finger print, dykes with roads on top and bridges. In the local supermarket (Family Market) we tried some Japanese snacks. I think it was part of a fish which was filled with fish eggs very salty. After the river was crossed we had to climb for the first time. The scenery at 1000m was great we could partly oversee the mountains, now I understood that Japan is for 80% mountains. The coming days we had to climb allot. The next days we cycled through the mountains to the volcano Aso-san. During this part of the trip we confronted with the fact that there where much more roads than on our 1:150000 map. So with only Japanese road signs it was not always clear where to go. With guessing and the compass we found our way out. On one morning the road was blocked by an earth/rock slide. Big rocks the size of a small car where on the road. Road workers already tried to explain us, but we understood "be aware of rock slides" not for a blocked road. By removing all luggages of the bikes and dragging it over the rocks we could pass the rock slide. While wild camping in the mountains the temperature dropped till 8°C which was a little bit cold combined with the wind. After passing Aso-san the route went to Saiki where the ferry sails to Sukumo (On the island Shikoku). While going there we passed a Japanese tourist attraction with tulips flower field. Japanese people are very keen to gardening and love flowers. Near there houses and along the road you can see a vast amount of flowers. The ferry to Sukumo took 3 hours where our route continued on Shikoku which is the smallest of the four main islands of Japan. Shikoku is a bit off the beaten track for tourists, but it is a relaxed place with beautiful scenery and historic sites. Along the road you can see pilgrims who walk the 88 temple route. Dressed in white clothes and with a walking stick they walk 1300km to see all 88 temples on Shikoku. It's a habit to wish each other good luck. When the see us they say "Gamba tee" which is Japanese for good luck and try your hardest. We wish them the same of course. Some pilgrims push/pull a kind of supermarket wagon along the roads with all there stuff. The first two weeks till about Kochi we didn't see western people so much. Only one American guy who was walking the 88 temple route. 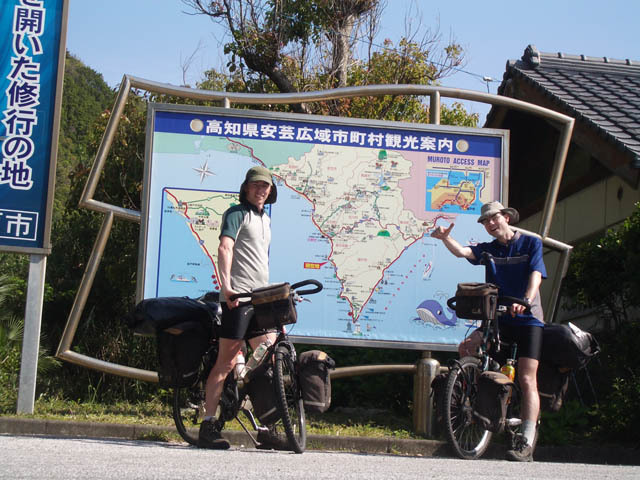 We cycled along the so called "sunny road" along the east coast of Japan. This area is fare away from the big industry. 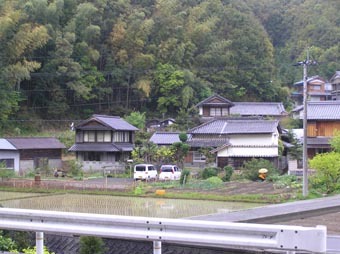 The landscape is filled with rice fields in the valleys and small villages along the coast. The main source for income is fishing activities. Near the concrete fisher harbours fish is dried in the sun. As Japan is the country of the rising sun we decide to camp near the coast to see sunrise in the morning (5:28). In the city Kochi we met a one leg cyclist from Japan. It was very impressive to see someone like him cycling, especially if you know how steep the mountain can be. Unbelievable! We gave him a postcard from our hometown in the Netherlands. He started to search in his bag for some minutes. Both of us got a pack of 12 kabuki (Japanese theatre) postcards. 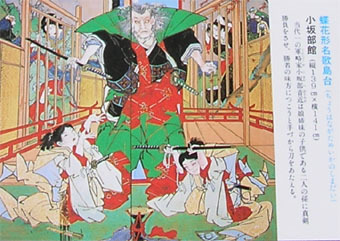 On these cards were violent scenes depicted in Japanese drawing style. Communication to our home was not so easy. Internet cafes are not so common and the telephones are mostly for domestic use only. Only the grey ISDN phones accept international calls. In Kochi we found an internet cafe. Each computer was placed in a small cabin with a comfortable 3 person seat and Xbox (gaming). After Kochi we got more in contact with the people on the street. May be they could speak better English or where more used to foreigners (gajin in Japanese). One time we were cycling along the road when a car came beside. The driver had opened the window and was talking to me. It was a Japanese woman, in a typical Japanese car, small and white. She said: "Please can you spend some time in my house?" We where curious. Before we know a cell phone was pushed in my hand. It was the daughter of the women. She explained that she like to speak English. The women said again: "Please come, it only 5 minutes by bicycle". We decide to join here. We followed the car that was driving slowly to the house. At the home of the women, the daughter (Waka) was waiting outside. 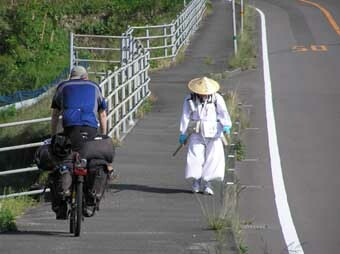 Waka looked a little surprised by the catch of her mother two gajin on bicycles. We were invited for thee. Japanese thee or English thee, was the question. We tried Japanese thee. An open and pleasant conversation was started. The mother explained that her daughter likes to chat a lot and that in her hometown no body can speak English with her. Waka studied photography in the UK and like to build up an artist life in Japan. The house consists out of two parts, new and old. The new part was used by the parents, Waka and her brother life in the most authentic part which was 150 years old. The house doesn't have central heating it not needed in this part of Japan. In the floor there is a place to make a fire, in ancient days the people cooked her she explained. All floors are made of "tatami" which is traditional Japanese flooring. Tatami is made of woven straw. It is never permitted to walk with shoes/slippers on it. After the tour through the house we decide to go on. After exchanging addresses we continued our trip.